If you’re new to tracking legislation or calling your representative, it’s likely that the fast pace of this congress and administration is making you feel anxious, scared, and completely out of your league. With that in mind, I want to give you some perspective on the legislative process that will hopefully ease some tension. If so few bills are actually enacted into law, and that’s a historical precedent, then why do lawmakers introduce so many bills knowing that they likely won’t even make it out of committee? And why does that matter? First, you need to know that the majority bills fail, because you have to prioritize your calls and the things that take your time and energy. It requires too much effort to follow every bill. Also, inciting mass panic about a potential dead-end bill only serves to scare people. 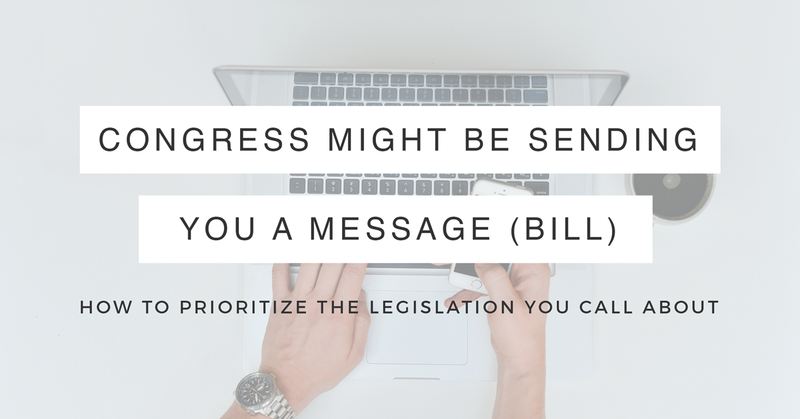 You’ll feel calmer and more in control if you know how to sort through the message bills and identify the significant legislation that needs your attention. Generating good press in their districts and states. Lawmakers draft a bill that they know doesn’t have a chance of passage along with a good press release and pitch it to media outlets. In many cases, media outlets also know that this legislation isn’t going to go anywhere, but they want the hits on their websites. People share it and get excited (or outraged) about the legislation and it builds up the base. Energizing the base. Some politicians introduce the same legislation year after year to stay popular with voters back home. Examples of this kind of legislation are HR 193 (American Sovereignty Restoration Act of 2017) and HR 24 (Federal Reserve Transparency Act of 2017). Looking productive. At town hall meetings or on phone calls with constituents, representatives can point to a list of bills they’ve introduced. In some cases, they’ll even have them available as handouts or something to put in an email newsletter. If you’ve never introduced legislation, it’s hard to prove productivity, right? Scoring points with activist groups. Many lobbyist groups will work with lawmakers to draft legislation that their members want. When the bill is introduced, the group sends out an email to its members which they hope will result in more donations for them and their organizations. So, how can you tell if a bill is a message bill or something that seriously has a chance of passing? Has the bill been introduced before? If so, how many times? Has it failed each and every time or even received a committee hearing? HR 193 (the bill to withdraw from the UN) has been introduced in some form or another for the past 20 years and isn’t worth the effort of a phone call. What is the potential climate of support for the bill? For example, an environmental bill addressing a timely and relevant issue will likely gain bipartisan and lobbyist support and have a greater chance of passage. Is it a bill that fits the majority party agenda? These bills may be pushed through quickly at the discretion of committee and party leadership in the House and Senate. Are the sponsors and cosponsors of a bill on the committee that the bill was referred to? For example, HR 193 was referred to the House Foreign Affairs committee, but the sponsor doesn’t sit on that committee. These tools and tips will help you become more comfortable with the legislative process and ensure that your calls and visits are taken seriously. You’ll be empowered to show your lawmaker and their staff that you have done your homework and you’re engaged with the process and their role in it.